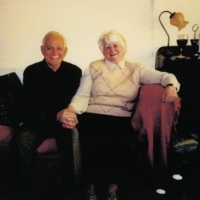 A photo of Linda and Peter smiling and holding hands sitting on a couch. 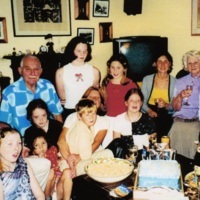 A photo of Peter in the midst of his family at his surprise 80th birthday party. 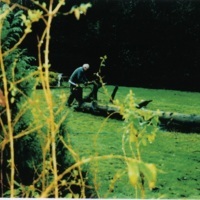 Peter pictured in his garden sawing up a conker tree. 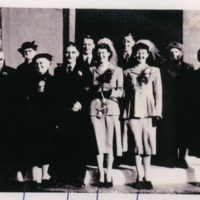 A photo of Peter, his bride, and their family and friends on his wedding day. 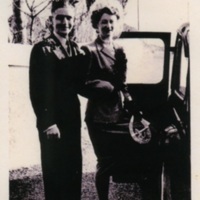 Peter and his bride about to step into their wedding car. 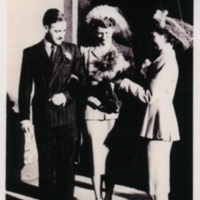 A photo Peter and his bride leaving the registry office arm-in-arm. 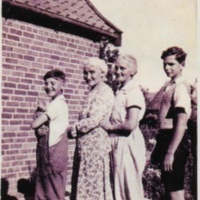 A photo of Peter as a child holding a cat, with his mum, granny and his older siblings. 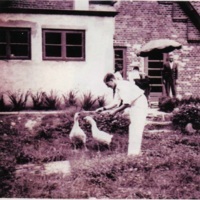 A photo of Peter as a child playing with geese in the garden. 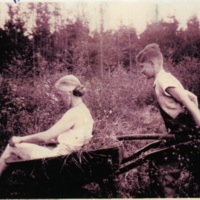 A photo of Peter pushing his mother in a wheel barrow in the woodland of his family home in Tremsbüttel.